The NHL rejected Russian Ilya Kovalchuk's landmark 17-year, $102 million contract with the New Jersey Devils on Tuesday night after it was deemed to circumvent the league's salary cap. Just one day after Kovalchuk and the Devils came to an agreement on the longest contract in NHL history, the league determined that it was illegal, a person familiar with the issues raised told The Associated Press on condition of anonymity because the NHL hadn't made a formal announcement. The contract was rejected because years of low salary at the end of the contract were added for the sole purpose of lowering the cap hit. The person added that no side believes Kovalchuk will play the final years of the deal at those terms. The star forward was slated to earn only $550,000 in each of the last five seasons of the contract that was to run through the 2026-27 season, when Kovalchuk would be 44. Only hours earlier, Kovalchuk beamed as the Devils held a news conference Tuesday in their home arena to officially announce that he was coming back to the team after a lengthy free-agent courtship. Kovalchuk finished last season with the Devils after being traded by the Atlanta Thrashers, who couldn't get him signed before he was set to hit the open market. 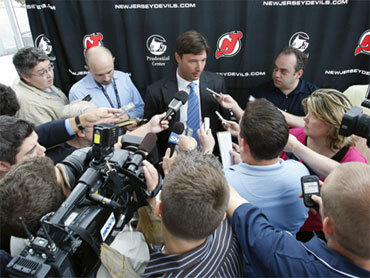 Kovalchuk dismissed money as a main factor in his decision to stay with New Jersey. He instead cited long-term security for him and his family and the opportunity to win the Stanley Cup with an organization that boasts three titles in 15 seasons. Kovalchuk's contract would have topped the 15-year deal goalie Rick DiPietro got from the New York Islanders, and two-time NHL MVP Alex Ovechkin's 13-year pact with Washington. Kovalchuk was to earn $6 million each of the next two seasons, $11.5 million for the following five seasons, $10.5 million in the 2017-18 season, $8.5 million for the 2018-19 season, $6.5 million in 2019-20, $3.5 million in 2020-21, $750,000 the following season, and $550,000 for the final five years of the unprecedented deal. The Devils would have absorbed an annual salary-cap hit of $6 million - the average amount per season. That number was brought down because of the extended years at low salary at the end. Whether he and the Devils can get together on a new deal remains to be seen. The Los Angeles Kings and the Russian KHL were also interested in signing Kovalchuk before he reached agreement with the Devils two weeks into the free agent shopping season. Few expected that New Jersey would break from tradition of not handing out long-term contracts that have become popular in the NHL since the lockout ended in 2005 and the salary-cap era began. Now that the Devils did that, their efforts quickly failed. Kovalchuk's time with the Thrashers ended once he rejected a 12-year, $101 million extension with Atlanta. He totaled 41 goals and 44 assists last season when he earned $7.5 million, but posted only 10 goals and 17 assists with the Devils. Kovalchuk had two goals and four assists during New Jersey's five-game, first-round playoff loss to Philadelphia.